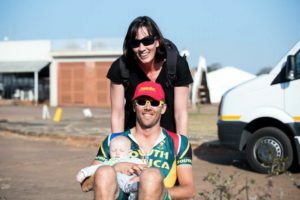 It has been a fairly quiet racing year since the arrival of our son, Pietman end of April for obvious reasons. This also meant quite a lot of interesting new challenges and adaptions in our lives vs the usual rhythm for training. 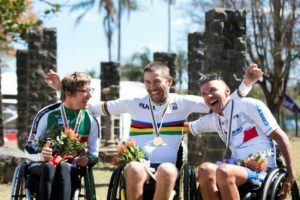 However, I think we came out adapting well in the end and not losing focus on what would be a very important Paracycling World Champs end of August as it was a first Paracycling World Champs hosted in SA. 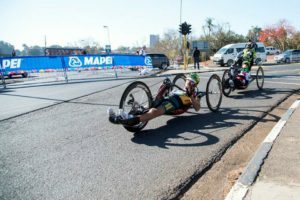 To throw another spanner in the works, 2 weeks before leaving for World Champs to Pietermaritzburg, it was dejavu from when I broke my neck with an elderly lady once again not seeing me and basically driving over me, but luckily it was more my bike and I did not have a scratch on me by the grace from God above. The bike’s frame came out ok although I realised I was going to have to zone out some loose particles inside a carbon frame making serious music to my ears while I am riding, come race day. Annoying but luckily it does not make you slower. Race week arrived and somehow I was feeling serious pressure on me as defending world champion in both TT and Road race as well as being one of the few, if not the only one in the team people perceived as a definite medallist. I think on top of this the pressure of putting your family through a certain lifestyle the first 4 months after birth and coming out here and not performing, just would not seem right. Time trial was first up on the Thursday and it was a tough course for us but on top of that, serious wind picking up which always makes it interesting. Warm up felt pretty good, but somehow my body just was not firing especially on the first lap of two. But I told myself that I knew it was a bad first lap, but maybe it can be a great second lap…and so it was. But unfortunately not good enough to get the gold and I had to settle for silver. In theory this should have taken the pressure off, because a medal at World Champs should be good for anyone but I just knew that was not my best and felt I had a score to settle in the Road race come Saturday. Saturday arrived and it was great to see quite a couple of the school kids from the schools I did some visits at during the week, out to support us. In this case again, warm up went well, but this time I felt my body was ready. From the start on the first drag up, I pushed hard to see who will be able to stick with me and it ended up being just me and of course the Swiss who took gold in the TT. It was a 5 lap race, so I wanted to make sure I control the race and not let anybody get back to us, so did most of the work up to the start of the 4th lap when I heard we had more than 3 minutes on the nearest rider. I then made sure to give my Swiss competitor some of the work and timed my break to perfection on the last hill of the final lap with only 2.5km to go. 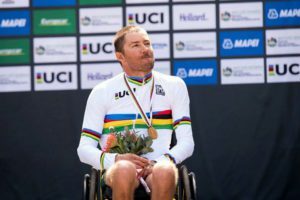 I did not want to stop pushing it in order to look in my mirror behind me, so I just kept red lining it until 10m from the finish line when I knew he is not going to come past now and crossed the finish line hand pumping in the air to take my fourth World Championship title, but this one on home soil! I now remain unbeaten in the RR from 2014 which is also something special. 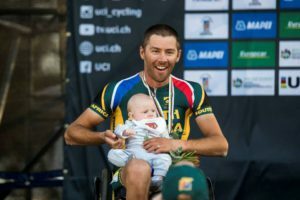 Obviously I sang the National Anthem on the podium with immense pride in the Rainbow jersey and managed to sneak up our little one, Pietman onto the podium at the end for some great special moments as a first time father and World Champion. This victory would not have been possible without a lot of patience, perseverance and commitment from my wife and my kid (although he does not know it). It is a real team effort. Also just a big thanks to coach Ray. We seem to be timing the important races to perfection each go. Also big thanks to my sponsors: Velotex, PowerbarSA, Deloitte and support from Zone3 and Cape Cycle systems. Big thanks also to Mark Williams from Bikefit in Rivonia for the amazing things we have done on my equipment. Unfortunately there was no rest for the wicked with Berlin Marathon only 3 weeks after World Champs. Have to say, once again, my 2 man support crew in Illse and Pietman, travelled like champions to Berlin and I felt in great shape. Unfortunately the weather decided not to play along and the hopes of a good time was destroyed by an incredibly wet and slippery push on race day. It ended up becoming a race for position to make sure I clinch win number 6 in a row in Berlin, which I did, but in my second slowest marathon ever of 2h44min. Nevertheless a great achievement taking my 12th marathon victory in a row and unbeaten in the marathon now from 2011. 2 more races to go for the year. Looking forward to it and let’s hope for some good weather.